The Bankers vest is a nice looking Vest made with 22 ounce Wool/Rayon blend. The lining is a premium satin with 2 inside pockets. On the outside are 4 pockets, perfect for any Cowboy on the Trail. The Stitching is re-enforced throughout for long wear. 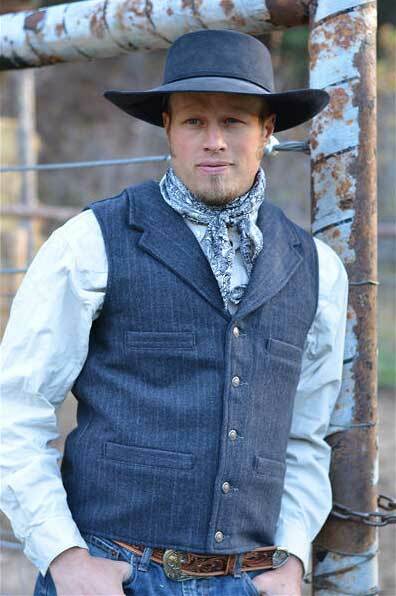 It comes in a very attractive Old West cut, and will work well for Reenactors Old West wardrobe or everyday Ranch Wear. The Wool Blend provides a natural water resistance, so it is great for a working Ranch Hand. The Banker is also available in 2 colors, Black or Charcoal.